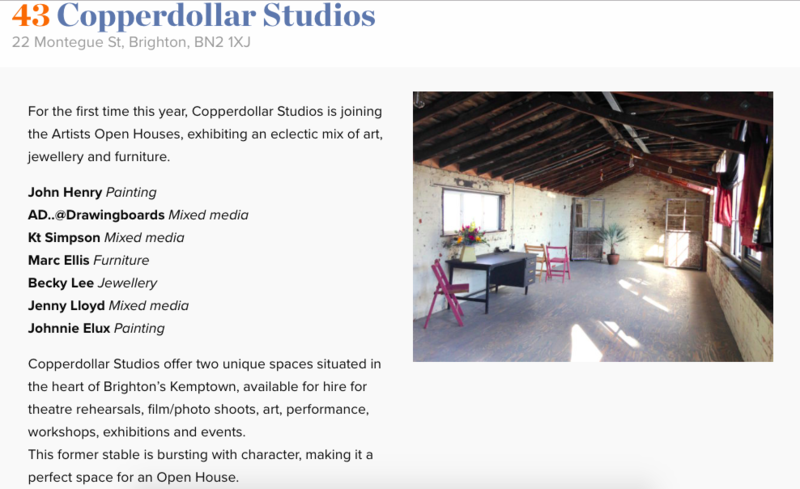 Copperdollar Studios is delighted to announce that for the first time since its inception, it will be taking part as a venue in this December’s Artists Open Houses. From the 6th til the 9th of next month, you’ll be able to visit the Studios anytime between 1pm and 8pm to explore the building and view the exhibits which are an eclectic mix of art, photography and furniture. Possessing an innate eye for detail, composition and colour alongside rigorous exacting methods of drawing stems from a career as a successful creative director based in London for over 30 years. Kt has been working professionally with dance, art and theatre for 35 year, creating her own shows. She has chosen to work with visual artists whose themes complement her own ideas and has found those collaborations incredibly rewarding. ‘Creating a show can start with a dance, a song, a poem or an image. It is a non linear experience, scrapbooking ideas and documenting the shows has always been central to my process’. Ad McEvoy has been an artist within the skateboard industry for the past 18 years. His artwork has been sold internationally. Ad’s passion is Drawing Boards, one of the few remaining UK independently run skater owned skateboard company’s, which he created over 10 years ago as an outlet for his art. AD will be exhibiting some brand new unseen work entitled “The Wheel of Life” as well as selling prints and skateboard decks. ‘I’m looking forward to hanging my wares at Copperdollar Studio as I’ve known Kt for a while now and I’m a big fan of the way she brings so many people together through performance and art . Also this will be the first time I have made physical prints to sell. Only 100 going so I’m excited to see the response! The new piece I’m showing is the most detailed I have done to date and I’m stoked to be unveiling it at Copperdollar Studios’. Special Branch Furniture was formed by Marc Ellis in 2011. Marc was trained in fine furniture making and design at Rycotewood College and has 30 years’ experience in a wide range of creative work projects. The scope and diversity of the work he has completed continues to inform and strengthen every element of the process at Special Branch Furniture. Special Branch Furniture has built a reputation for uncompromising quality and attention to detail. Their client base consists of private individuals, retailers, developers, artists, architects, designers and other craftsmen. Jenny will be exhibiting acrylic paintings, linocuts, mono prints and pastels. ‘I am so pleased to have been asked to show my paintings and drawings at Copperdollar Studios this Xmas because it’s such a perfect space for display with plenty of room for guests and artists. The Urban Flora collection of photographs are all about colour and nature popping up in our cities and towns. All available on 100% recycled paper which is very yummy. More prints by Moose Azim of Brighton Life are also on show. We can’t wait to be a part of this wonderful celebration of creativity. To talk to us about the Studios, use any of the links below! Don’t forget to get in touch if you’ve got a project which needs a beautiful, versatile space to help make it happen.